Janet and Russell, you have both articulated with passion your diametrically opposed views about the degree to which the state should regulate our private lives. Case in point elsewhere: To combat obesity, the mayor of New York proposed the ban of Coca-Cola and other “sodas” in containers bigger than 16 ounces. Case in point here: The local lobby against alcohol abuse wants a floor price for grog and re-introduction of the banned drinkers’ register. With your sustained interest in the issues you both have attracted supporters, in Alice Springs and elsewhere, to your respective views about paternalism, the nanny state and the privilege of people making their own decisions. This has resulted in a sometimes heated, mostly interesting and always revealing debate in the readers’ comment section of this website. Thank you! I have found in the current New York Review of Books a concept which may provide a compromise between your positions while not requiring either of you to lose face: It’s called “nudging”. I recommend to you the review, by Cass R Sunstein, of Against Autonomy: Justifying Coercive Paternalism, by Sarah Conly. This, in a nutshell, is what Conly argues. She quotes neocon hero John Stuart Mill: “As a general rule, government cannot legitimately coerce people if its only goal is to protect people from themselves. Mill is saying people are the best judges of what’s good for them, a belief examined in the book and found to be flawed, and some fascinating reasons are given. Conly points out that society has determined that it can’t agree with Mill at all times: seatbelts and motorbike helmets are an example. So where is “coercive paternalism” justified? • The activity that paternalists seek to prevent must genuinely be opposed to people’s long-term ends as judged by people themselves. If people really love collecting comic books, stamps, or license plates, there is no occasion to intervene. • Coercive measures must be effective rather than futile. Prohibition didn’t work, and officials shouldn’t adopt strategies that fail. • The benefits must exceed the costs. • The measure in question must be more effective than the reasonable alternatives. If an educational campaign would have the benefits of a prohibition without the costs, then Conly favours the educational campaign. And coercion should regulate means, not ends. So what of the issues about which the government should not be putting down its foot? This is where “nudging” comes in, steering “citizens in directions that will make their lives go better by their own lights,” says the review. “For example, cell phones, computers, privacy agreements, mortgages, and rental car contracts come with default rules that specify what happens if people do nothing at all to protect themselves. “Default rules are a classic nudge, and they matter because doing nothing is exactly what people will often do. 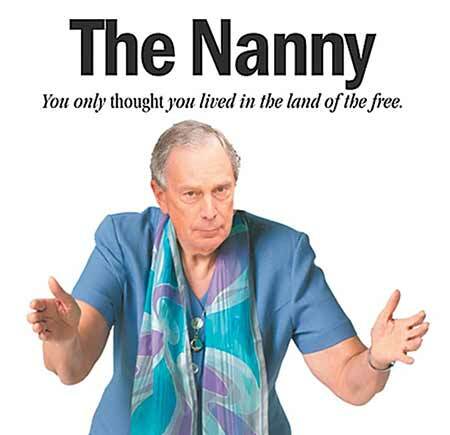 IMAGE: Detail of a 2012 ConsumerFreedom.com advertisement protesting New York Mayor Michael Bloomberg’s proposed ban on the sale of soft drinks in containers larger than sixteen ounces. He is portrayed in a nanny uniform. The image illustrates the Review article. @ Hal Duel. March 5. “Mutual admiration pact” confirms that your earlier comment of Janet “doing me like a dinner” is contradictory, Hal. You, whom I once thought was considering standing for public office by the deluge of social commentary over the past five years or so, don’t seem to have yet got the message that in the interests of public health, I have drawn a line and only responded at this post by invitation of the Editor in as polite a manner as possible. All the best in your career of super serial social commentary across the issues. I wish you well. I thought the point of the exercise was to “nudge” both of you toward a compromise, a meeting of minds. If I misread that, then I withdraw my original comment. If not, then I repeat – Nice try, Erwin. For the record (again), I am all for alcohol restrictions, a point I have made many times before. I am also all for personal responsibility, another point I have made many times before. I don’t see them as mutually exclusive. If I crash my car, I am up for damages, at the least. But we also have restricted speeds in urban areas, especially around schools where it is acknowledged that some are more vulnerable than others are at other locations. I’m not taking sides here, Russell. I quite enjoy following the pair of you over the hill and down the dale of your mutual admiration pact. @ Hal Duell. March 4. What is it about Janet and my open and ongoing discussion at the polite request of the Editor that elicits your sense that we have somehow failed, Hal? Alcohol does not have its tentacles into everything. That is the reply of a preacher who is always telling his congregation that the devil is in everything that is worldly. And the Victor Harbour thing – PLEASE!!! We live in a day and age that has evolved from many atrocities to say sorry for all the wrongs of our past we would never get on with a future of some resemblance of equality. The days are long gone when a son is held responsible for the sins of the father or vice versa. We live in a day and age of individual responsibility and individual goals. But we also live in day and age of socially acceptable behaviours so that we can live and survive in communities. With respect and working towards the common good that does not remove the individuals’ rights to their lifestyles and beliefs. It is not the role of communities to whip themselves if someone falls short in their own personal responsibilities. That is not personal responsibility by the individual and how can that help. But this is the place we find ourselves. IS EVERYONE ELSE’S FAULT BUT MINE, that is what Russell and others say to those who escaped the independence of self-respect and personal responsibility. It is my belief and understanding that we address addictive behaviours through treatment and centres but it is also well known that those people need to acknowledge they have a problem and seek help. That is referred to as respecting their individual rights. When their behaviours exhibit violence or participate in criminal behaviours then the matter is total different. Also remembering that in law we see dependency on drugs and alcohol as excuses in law when dealing with criminal behaviours. But that excuse is not a get out of jail free card. But for too long it has been. Rehab for drunks and drug addicts. Complete the programs and then ensure testing after release as part of the parole requirements. This reinforces personal responsibility by the offender. We need to live together and respect everyone’s right to live eat drink and behave as they like. BUT!!! Not to input on the harmony of community living in a negative way. That does not mean we cannot disagree, debate and so forth. But in a democracy we agree to disagree. Individuals have an obligation to themselves and society. And if someone what’s to mother an individual or individuals that are in need of help. Do it. I do. And I do it without blaming everyone else. We live in a world where emotional handicaps are predominantly growing all the time. Which is why escape though drugs alcohol and many other forms of numbing medications is growing. And the tougher the struggle to survive in this world with homelessness growing daily in Australia. Cost of living sky rocketing. Basics like electricity, gas and water are now costing more and more so living standards are changing. This impacts on lives in winter in our below 0 temperatures here in Alice. Businesses closing down. People committing suicide to escape their free falls into despair. This is what we should be focusing on and demanding legislative change about. The nanny state that forces rules costs and impacts on every facet of life as we know it through greed, corruption, deceit and plain stupidity. Thank you for your letter. This may not be what you are expecting by way of reply, but my campaign for better alcohol management in central Australia over the past twelve months has been driven by one thing only and that is my concern for the mostly Aboriginal friends (many deceased) with whom I live and have lived and worked beside for thirty years. The fact that they are disproportionately represented in social indicators of disadvantage, suggests that they are the most vulnerable section of NT society and so I have taken to defending them from the self-harm as a result of an epidemic of alcohol mismanagement in our nation, particularly in the NT. Your letter concerns the “nanny state” stepping in to regulate the free market supply of alcohol or not as I understand it. Some say that I have been obsessed with alcohol in every social issue raised, but my experience has shown me that alcohol has its tentacles into every area of Aboriginal society in central Australia and they are a legitimate part of the population. Some say that it’s “paternalistic” to discriminate about where Aboriginal people can drink (even though they already suffer the consequences of discrimination as a group of people) and that seven days per week take-away and any other form of restriction of supply, including health warnings on product should be left to supply and demand. Be that as it may, most people appear to believe that it’s a community problem and would rather a community-led solution, rather than the “nanny state” step in, even though without legislation there is no stopping those who cannot agree to act in the community interest. What is the best interests of the community remains polarized to this day. I would like to bring to the attention of the Alice Springs Town Council, as the local community governing body, a response of the City of Victor Harbour Town Council in SA, where there is a plaque on the foreshore that reads: “Sincere Expression of Sorrow and Apology to the Ngarrinderi People. “To the Ngarrinderi People, the traditional owners of the land and waters within the region, the City of Victor Harbour expresses sorrow and sincere regret for the suffering and injustice that you have experienced since colonization and we share in your feelings of shame and sorrow at the mistreatment your people have suffered. “We respect your autonomy and the uniqueness of your culture. We offer our support and commitment to your determination two empower your communities in the struggle for justice, freedom and protection of your Heritage, Culture and interests within this Council area and acknowledge your right to determine your future. “We commit to work with you. We acknowledge your wisdom and we commit to ensuring our actions and experiences best assist your work. We accept your frustrations at our past ways of misunderstanding you. We are shamed to acknowledge that there is still racism within our communities. “We accept that our words must match our actions and we pledge to you that we will work to remove racism and ignorance. We will recognize your leadership. We honour your visions, and we hope for a future of working together with respect for each other. We look for and two a living reconciliation with justice. “We walk beside you, and stand with you to remedy the legacy of 166 years of European occupation of your land and waters and control of your lives. “The work of the City of Victor Harbour will be guided by your vision of a future where reconciliation through agreement making may be possible and we may work together. I’ll leave it with you to draw your own conclusions about how such a statement might make a difference to Alice Springs, although it’s a different city to Victor Harbour, in that it’s a multi-national destination, both in the Indigenous visitation to traditional Arrente country and those who come lately. Thanks for this letter Erwin, I’ve always been fascinated by reading the comments section in the ASN. I like the fact that although sometimes I have a definite view about something, I can then read a comment by a reader that challenges my ideas. I believe that this is how we learn and improve our knowledge of things, by seeing viewpoints and arguments that differ to our own. Some viewpoints obviously are polar opposite to mine, but at least everybody has the chance to have a say. I can recommend the review that is hyperlinked in this letter, I found it fascinating to the point that I may have to buy the book to understand this concept even more. Thanks for a good read.